In the heart of the Midland’s glorious countryside awaits the Forest of Arden Marriott Hotel & Country Club, Marriott Golf’s flagship venue in the UK. This awesome golf resort is one of the most highly regarded in the country, thanks in large part to the two outstanding championship golf courses. Both courses, the Arden and Aylesford, were designed by the legendary Donald Steel, with the Arden being the headline course, having hosted the European Senior Masters three times. This fantastic golf destination is found less than 30-minutes from Birmingham city centre, ideal for golfers throughout the UK, yet is surrounded by some 10,000 acres of countryside. The 4-star hotel lives up to the high standard set by the Marriott brand, with excellent customer service and facilities throughout. The luxurious Cedarwood Spa is a highlight, as is the delightful Cast Iron Bar & Grill. The Arden Course is one of the country's most established tournament layouts, having hosted the cream of the European Tour for the British Masters from 1997-1999 and in 2003, and the English Open between 1993-1997 and from 2000-2002. Scoring was often good during these professional events with low scoring totals achieved by Ian Woosnam (1993) and Per-Ulrik Johansson (1997) with 4-round scores of -19. Champions at Forest of Arden also include Colin Montgomerie (1994) and Darren Clarke (2000 & 2002). This is indicative of the quality of the course, which has some truly distinctive holes, especially the 18th, an exacting par-3. When stretched to its fullest, the Arden will measure 7,213 yards, and demand the absolute best in striking in order to score well. Should you manage to find the green in regulation, the outstanding putting surfaces will give you a good chance to convert. With so many travelling to Forest of Arden each year it is easy to see why so many enjoy golf breaks at The Forest of Arden each year. The Aylesford Course is considerably shorter than its prestigious neighbour, but the expert attention of the greenkeepers ensures that it remains in equally immaculate condition. The Aylesford may be less than 6,000 yards, but underestimate it at your peril, as there are penalties to be paid for the wayward. This charming little course adds good variety to the Forest of Arden's repertoire, and emphasises the quality of a golf break at the resort. In addition, the Forest of Arden is home to a first class golf academy, where visitors can seek the guidance of one of the resident PGA professionals. From the back tees, the Arden's 202-yard 18th hole demands a solid draw with a long iron or fairway wood. 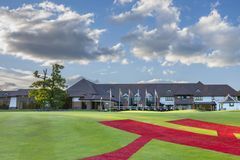 Although the golf courses may be the star turn at the Forest of Arden Marriott Hotel & Country Club, the superb hotel should not be underestimated. With 214 rooms and unparalleled facilities and service, your golf holiday here will undoubtedly be a memorable one. The outstanding facilities make this a great choice for a leisure or spa break, while those who choose a golf break at the Forest of Arden Marriott Hotel & Country Club will be rested and rejuvenated in the hotel, ready to tackle the superb courses once again. The Cedarwood Spa centre at the Forest of Arden Marriott Hotel & Country Club is a luxurious facility, offering an extensive variety of health and beauty therapy. Speciality treatments include body scrubs and wraps, facials, manicures, pedicures, massages and waxing. For the fitness-conscious, the leisure club has an excellent swimming pool, sauna, steam room and gymnasium, while there are also tennis courts, table tennis and croquet. The Zest Bar serves good meals and drinks throughout the day. A fantastic experience which was enjoyed by all. Hotel was very well organised with great food/drink. Rooms are spacious and comfortable. Highly recommendable. Rooms were clean and tidy (basic but fine for 1 night stay). Beds very comfortable. Staff friendly and excellent. Didn't use pool or spa due to lack of time. We stayed one night and got all we hoped for, the food was great and the staff very customer focussed. Room very comfortable. Food average, drinks very expensive, staff good, don't do egg cups? Room miles from reception. If you want to split an extras bill with your mate/s a long complex process. Forest of Arden was an absolute delight from beginning to end. Having looked around at plenty of options, YGT kindly pointed our attention towards the Forest of Arden and we are very glad they did so. We were booked in to tackle the Aylesford course on the first day which was a fantastic club standard course with plenty of tricky holes. The challenging Par 4 11th was a particular highlight for the group. After our round we nipped into the 19th hole for a couple of beers (reasonably priced) to reminisce about the shots of the day and those putts that didn’t quite make it to the hole. There was a seamless check-in at the hotel and the rooms were of a high standard, as you would expect from a Marriott. Dinner was a buffet selection or you could order from the 3 course menu too. We chose the buffet and the food was perfectly acceptable. Breakfast was a buffet again and was fantastic as well, with a great selection including continental options, full English and an omelette station for a fresh dose of protein to tee us all up for the day ahead. What a course, with the back nine holes through the deer park. Highlights have to be the par 3 8th over the lake and the par 3 18th which measures 202 yards into the wind and over the lake heading towards the clubhouse. This is a real championship course and obviously the pride and joy of everyone who works there. If you’re looking for a value for money weekend golf break with two good courses and accommodation to match, then The Forest of Arden is definitely worth a visit. Forest of Arden is a great venue and the courses were in fantastic condition, particularly the greens. The hotel rooms were also excellent, as was the food although the menu choice was a bit limited. The resort is easy to get to and the organisation throughout was very good. The price of drinks was high but this was only a small blip on an otherwise excellent trip. My friend and I had a great time at the Forest of Arden. Marriott really know how to train their staff so you get the feel they are enjoying your break with you rather than just serving you. A really nice touch. The golf courses were both immaculate and the shorter Aylesford course is certainly not inferior to the Championship Arden course. There seem to be more hazards per hole on this track to combat the lack of length. We tied this break in with a corporate day and we were delighted that Your Golf Travel were able to arrange golf on the other two days with great tee times each day. The price reflected the fact we were only paying for two rounds as well. In fact, it was not possible to tailor the package directly with the hotel. I have travelled on trips arranged by YGT before but this is the first time I have dealt directly and I have to say you guys were superb, keeping me informed throughout the process. I’ll definitely come back to YGT next time and would certainly recommend Forest of Arden to other golfers. Thanks to Your Golf Travel for helping us organise our annual trip to the Forest of Arden. What a superb venue! The hotel is of outstanding quality; well organised with smooth, professional service. The golf courses are also superb with many in our party saying the Arden Course was the best course they had ever played. Imagine our trepidation when other guests in the hotel were telling us that the greens on the Aylesford were even quicker than those on the Arden! The clubhouse was very efficient and our only gripe would be the excessive costs for a sarnie or light snack. The hotel meals were superb as were the rooms; opulent was just one remark from a member of the group. The whole place is very well run and we’d have to give the venue a 9 out of 10. Many thanks for arranging the golf package at Marriott Forest of Arden. We were very impressed by the venue, both in terms of the hotel, and the courses. The hotel staff were very welcoming and sorted out great rooms for our group. Nothing was too much trouble. The Aylesford Course was a good warm up round before we played the far more testing Arden course. Unfortunately a deluge of biblical proportions halfway through our round meant we had to abandon the course, but the staff in the clubhouse had no problems in fitting us back in to finish the game the next day. Aside from the golf, we enjoyed the fitness centre, the spa and, of course, the bars! The quality of the dining was also excellent, given the cost of the package. The venue is a big conference centre, so the hotel bar can get crowded. We even had a surprise visitor, when coming downstairs for our afternoon round we spotted the familiar face of HRH The Duke of York being greeted by the hotel management. It turned out he was not coming to play a quick 18 but to address a conference of newspaper editors. Overall, the venue and organisation was first class, and fantastic value for money. Overall we had a really lovely stay at the Forest of Arden. All the guys were really pleased with both courses, especially the Arden course, and they said there was a lot of wildlife around including deer which they thought was brilliant! We (the girls) thought the gym and spa facilities were brilliant; probably the best we've experienced whilst on such a break so big thumbs up there!! The hotel was really lovely and the staff were brilliant! So in all a lovely stay. Thanks so much for organising my booking to the Marriott Forest of Arden Hotel, Golf and Country Club. I went with my son for 2 day break and after a 2 hour journey from the Wirral we arrived at the hotel at midday; just in time to have a spot of lunch in the Zest restaurant. After a lovely club sandwich and a latte we headed to the Aylesford course to tee off at 1.30pm. The starter was excellent, giving us some handy local information on the course and taking a few photos for us too. The course was in excellent condition and we both enjoyed a competitive round which finished at 17:30. Having checked into the hotel, we showered and changed and had dinner in the restaurant, following of course by a bottle of red in the bar which we settled into comfortably! The next morning after a hearty full English we headed off to the tee on the Arden championship course which proved to be very challenging, with long par 4s & 5s and plenty of water to contend with. The greens were being maintained which meant a lot of sand on them but once you got used to the pace it was fine and they ran straight and true. Overall it was an excellent 2 day golfing trip which we both thoroughly enjoyed. We had a great time thanks on our golf break to Forest of Arden, which was expertly arranged by yourgolftravel.com. I have to say that the Forest of Arden’s customer service was exemplary and they really took good care of us. I had an issue with my golf shoe (the sole was flapping around) and the receptionist obtained some glue for me from the maintenance area so that I didn’t have to go and buy a new pair. I’m not sure you’d get that type of honest service at other resorts and it was especially appreciated considering I already have two more pairs at home! The golf course as always was challenging and with the greens having been recently hollow-tined, was difficult. The deer as ever were a sight to see, especially with their young. I have no complaints at all and it was really nice to see some good old fashioned customer service; 10 out of 10 for the resort. I will be organising next year’s trip so of course will be in touch with YGT, with potential dates and approximate numbers when I know what’s going on. I organised a party of 12 to spend a weekend enjoying the facilities at Forest of Arden and truth be told, we couldn’t have asked for a better place to accommodate a group of twenty-something enthusiastic golfers. The layout of the hotel and golf facilities is great and the standard of the rooms, service and food in the hotel is superb! We certainly took full advantage of the all-you-can-eat buffet! The Aylesford course offers a forgiving 18 holes and serves as a nice warm-up to the Arden course. Once you step onto the Arden course it is a completely different feel and once you hit the turn it is truly magnificent. A member of our group described the back nine as the nicest 9 holes of golf he has ever played which is high praise indeed...even in October! The pristine fairways and deer running around all over the place it is truly stunning and the deal we booked through yourgolftravel was an absolute bargain! Thanks guys! Thanks Your Golf Travel for our recent trip to Forest of Arden. It was very good and the weather was fair which was a bonus! The Aylesford course was good but not a world beater. A fair test of golf though. The Arden course on the other hand was in great condition and was a fine test of golf. The starter was very helpful especially with moving our tee time around a bit and his attitude reflected that of most staff members at the resort. I thought clubhouse prices were a bit steep which was a shame and the bar staff were slow to serve. The rooms in the hotel though, were first class. For what we paid I’d have to say it was fantastic value for money and YGT did us proud so we’ll definitely be using you guys for our next trip. Our trip to Forest of Arden was very good and would highly recommend it to other golfers. The Arden Course was in excellent condition and the layout was great. If you can shape the ball well, you’ll definitely have an advantage. It’s a proper test of golf with its large and very fast greens. Just a pity my golf wasn't up to it! The Aylesford Course was also in excellent condition but the layout wasn’t quite as entertaining as the Arden Course. It’s a bit easier and has a “new” feel to it. The clubhouse was more like a health club bar but it was busy so the atmosphere was good and in terms if prices, it’s pretty much what you expect from a resort like this. Service throughout the resort is good and the staff are really helpful. While the food wasn’t amazing, it certainly did the job. The resort is really easy to find and I’d imagine its central location would be convenient for most in the UK. I’d give the break 8/10 as it was really good value for money and would definitely recommend YGT to others looking to book a similar break. A lovely challenging courses which tested the better golfers. 18th par 3 sorted us out. Fabulous course! For early November greens were is A1 condition (still pretty fast and flat...there are also large and undulating making them a very stern test). Course layout is beautiful - deer freely roaming the tree-lined course. Many holes with water hazards just to add to the mix! Would highly recommend a round here (I will be back). Relatively short course but still a good test. Layout good and interesting. Green had just been spiked and sanded (it was early November) so were slow and a little uneven. Overall experience was good - would like to play when greens in better condition during Summer/Autumn. A great course in great condition with very challenging quick greens. Round took 6 hours!! mainly due to delays by group in front. We enjoyed playing this course with some challenging holes.